RapidWeaver stack; display Instagram photos on your site. Is there a better alternative to QuickPics Instagram Stack? Is QuickPics Instagram Stack really the best app in HTML category? Will QuickPics Instagram Stack work good on macOS 10.13.4? 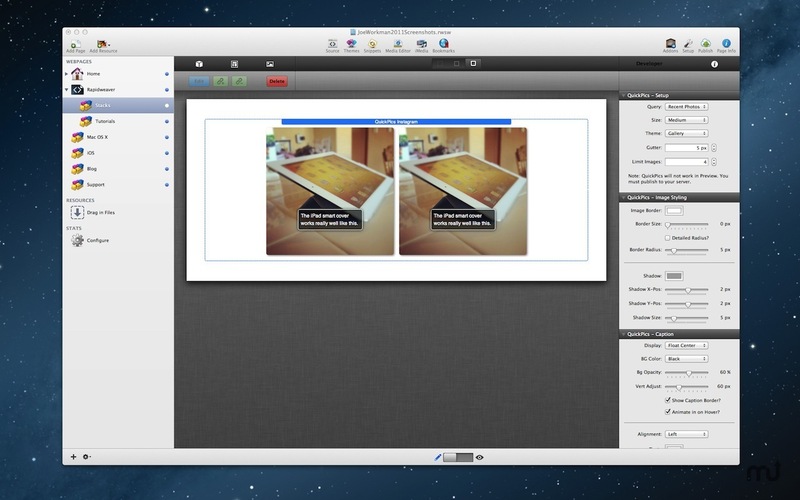 QuickPics Instagram Stack is the ultimate way to display your Instagram photos onto your RapidWeaver website. This stack supports displaying your images in both gallery and slideshow formats. You have full customization controls how how to style all aspects of the photos. You can display your captions in four awesome formats. To top it off, its fully responsive! QuickPics Instagram Stack needs a review. Be the first to review this app and get the discussion started! QuickPics Instagram Stack needs a rating. Be the first to rate this app and get the discussion started!